Come and play at Museum Playdates - our newest program for 2 – 5 year olds! Each playdate runs for an hour and is facilitated by a resident Museum learning expert. They are themed according to different, exciting Museum topics, and aim to help kids make sense of the world around them through objects in our collection. Our first playdates for the year, on February 26 and March 26, are Rock Playdates –learn about rocks and the minerals that form them in this geology-inspired program. We’ll have a sensory-friendly session before normal opening hours, from 9am to 10am, and an all-systems-go session at 11am to midday. Stomp along to the Hello Museum Dino Disco on Saturday 30 March for an evening of dance and dinos! We’re opening our Science and Life Gallery and our Pauline Gandel Children’s Gallery after hours, so you can come along and wiggle, jump, twist and hop with our very own Dino DJ! Developed for families with kids aged 4 – 12. Children under 3 - free! From Monday to Friday, the Pauline Gandel’s Children Gallery comes alive with adventures and mysteries from the Hello Possums Story Time collection. Suitable for ages 0 – 5, subject to storyteller availability. Dress ups are very welcome! Keep an eye out for our special National Archaeology Week edition of Storytime in May 2019. In special homage to Melbourne’s Cole’s Book Arcade – the largest bookstore in the world during the 19th century – we’ve created our own version of one of their most popular titles, the Giant Funny Picture Book. Every Sunday from 11 – 3 throughout February and March, you’re invited to help fill it up! Write, draw or pen a poem – from your favourite joke to your silliest made up character, anything funny goes at Hilarity in Print! Our Little Sparks program is all about play-based learning for littlies aged 3-5. It offers 50 minute, fun-filled workshops led by a Scienceworks educator according to themes that change throughout the year. Our first workshop in the series is ‘Float your Boat’ – it’s sink or swim as we discover the highs and lows of density and explore which solids, liquids and gases will sink, and which will float! Please bring appropriate clothes for your little learner, as this one is bound to get a little wet and messy. Please note that parents/carers are expected to participate in the workshop too. We recommend a max of two children per parent/carer. Scienceworks’ robotics and coding workshops are back with STEM Sundays! We’ve got four different workshops available for ages 5 – 18+ that run over most Sundays from February to June: Lego Robotics and Coding (8 – 12), Storytelling with ScratchJr (5 – 7) and Makey Makey (6 – 10). We also have a Beginners’ Workshop for Adults available for all the big kids in your life! Check out our web page more information about each workshop. Tickets range from $20 - $40. Experience the cool and quirky with a huge range of robotics and tech activations at Robotica: Festival of Futurism. 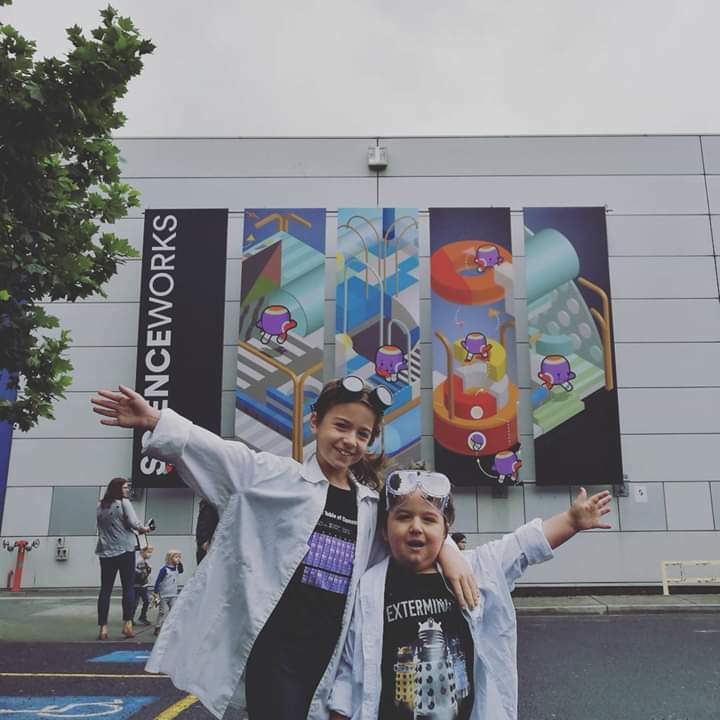 From 10am–3pm on Saturday, 2nd of March, Scienceworks will open its doors to a wide range of collaborators and exhibitors to host a tech expo featuring interactive robotics, technology, VR, makerspaces, exhibits, a range of speakers and a DJ! The event is most suitable for ages 12+ and families with teenagers, but everyone is welcome to attend! We are excited to announce our new Planetarium show Moonbase ONE! The Moon has always captivated humanity, inspiring us to leave the world behind and venture into space. Come on an amazing adventure as we strive to understand our magnificent neighbour the Moon. Recommended for ages 8 and up. After an exciting Little Kids’ Week In, we’re looking forward to the next Day In on May 6. Dress up as your favourite sea creature and dive into a day filled with play-based activities and shows! Perfect for under 5s, parents and carers. More information here. And while you’re there be sure to check out the rest of Scienceworks and the Museum! Wild Nights is back at Werribee Zoo for one week only! This is the fifth year that the zoo has opened up the gates after dark but there are some changes this year. All the favourites are back- marshmallow toasting, glow zone, fire dancers, lantern parade and hot chocolate and there is also the amazing Cirque Africa putting on 30min performances. The full program is online when you buy tickets and the dusk safari, serval presentation and circus need to be booked in advance. You can also purchase tickets at the gate, members receive a discount. Marshmallows are provided once dark falls but I'd recommend taking your own so you can start roasting as soon as you arrive. The highlight for us this year was the circus! Cirque Africa combines dance and live music with some pretty spectacular tricks. All the seats are close to the stage so you don't miss a thing. Wild Nights will be on at Werribee Zoo for one week only.